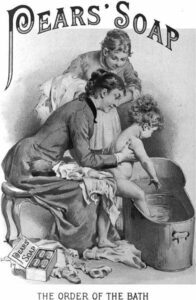 Public opinion about bathing began to shift in the middle and late 18th century, when writers argued that frequent bathing might lead to better health. Two English works on the medical uses of water were published in the 18th century that inaugurated the new fashion for therapeutic bathing. One of these was by Sir John Floyer, a physician of Lichfield, who, struck by the remedial use of certain springs by the neighbouring peasantry, investigated the history of cold bathing and published a book on the subject in 1702. The book ran through six editions within a few years and the translation of this book into German was largely drawn upon by Dr J. S. Hahn of Silesia as the basis for his book called On the Healing Virtues of Cold Water, Inwardly and Outwardly Applied, as Proved by Experience, published in 1738. The other work was a 1797 publication by Dr James Currie of Liverpool on the use of hot and cold water in the treatment of fever and other illness, with a fourth edition published in 1805, not long before his death. It was also translated into German by Michaelis (1801) and Hegewisch (1807). It was highly popular and first placed the subject on a scientific basis. Hahn’s writings had meanwhile created much enthusiasm among his countrymen, societies having been everywhere formed to promote the medicinal and dietetic use of water; and in 1804 Professor E.F.C. Oertel of Anspach republished them and quickened the popular movement by unqualified commendation of water drinking as a remedy for all diseases. A popular revival followed the application of hydrotherapy around 1829, by Vincenz Priessnitz, a peasant farmer in Gräfenberg, then part of the Austrian Empire. This revival was continued by a Bavarian priest, Sebastian Kneipp (1821–1897), “an able and enthusiastic follower” of Priessnitz, “whose work he took up where Priessnitz left it”, after he read a treatise on the cold water cure. In Wörishofen (south Germany), Kneipp developed the systematic and controlled application of hydrotherapy for the support of medical treatment that was delivered only by doctors at that time. Kneipp’s own book My Water Cure was published in 1886 with many subsequent editions, and translated into many languages. The popularity of wash-houses was spurred by the newspaper interest in Kitty Wilkinson, an Irish immigrant “wife of a labourer” who became known as the Saint of the Slums. In 1832, during a cholera epidemic, Wilkinson took the initiative to offer the use of her house and yard to neighbours to wash their clothes, at a charge of a penny per week, and showed them how to use a chloride of lime (bleach) to get them clean. She was supported by the District Provident Society and William Rathbone. In 1842 Wilkinson was appointed baths superintendent. 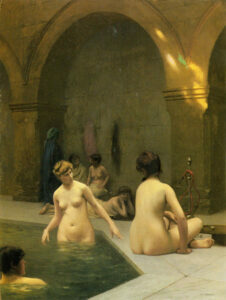 Traditional Turkish baths (a variant of the Roman bath) were introduced to Britain by David Urquhart, diplomat and sometime Member of Parliament for Stafford, who for political and personal reasons wished to popularize Turkish culture. In 1850 he wrote The Pillars of Hercules, a book about his travels in 1848 through Spain and Morocco. He described the system of dry hot-air baths used there and in the Ottoman Empire which had changed little since Roman times. In 1856 Richard Barter read Urquhart’s book and worked with him to construct a bath. They opened the first modern hot water bath at St Ann’s Hydropathic Establishment near Blarney, County Cork, Ireland. The following year, the first public bath of its type to be built in mainland Britain since Roman times was opened in Manchester, and the idea spread rapidly. 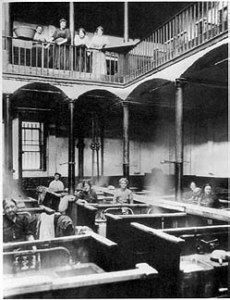 It reached London in July 1860, when Roger Evans, a member of one of Urquhart’s Foreign Affairs Committees, opened a Turkish bath at 5 Bell Street, near Marble Arch. During the following 150 years, over 600 Turkish baths opened in Britain, including those built by municipal authorities as part of swimming pool complexes, taking advantage of the fact that water-heating boilers were already on site. Similar baths opened in other parts of the British Empire. Dr. John Le Gay Brereton opened a Turkish bath in Sydney, Australia in 1859, Canada had one by 1869, and the first in New Zealand was opened in 1874. Urquhart’s influence was also felt outside the Empire when in 1861, Dr Charles H Shepard opened the first Turkish baths in the United States at 63 Columbia Street, Brooklyn Heights, New York, most probably on 3 October 1863. “The order of the bath”; Pears soap advertisement. Soap reached a mass market as the middle class adopted a greater interest in cleanliness. By the mid-19th century, the English urbanised middle classes had formed an ideology of cleanliness that ranked alongside typical Victorian concepts, such as Christianity, respectability and social progress. The cleanliness of the individual became associated with his or her moral and social standing within the community and domestic life became increasingly regulated by concerns regarding the presentation of domestic sobriety and cleanliness. Before the late 19th century, water to individual places of residence was rare. Many countries in Europe developed a water collection and distribution network. London water supply infrastructure developed through major 19th-century treatment works built in response to cholera threats, to modern large scale reservoirs. By the end of the century, private baths with running hot water were increasingly common in affluent homes in America and Britain. At the beginning of the 20th century, a weekly Saturday night bath had become common custom for most of the population. A half day’s work on Saturday for factory workers allowed them some leisure to prepare for the Sunday day of rest. The half day off allowed time for the considerable labor of drawing, carrying, and heating water, filling the bath and then afterward emptying it. To economize, bath water was shared by all family members. Indoor plumbing became more common in the 20th century and commercial advertising campaigns pushing new bath products began to influence public ideas about cleanliness, promoting the idea of a daily shower or bath. Today, most homes in Japan have a bathroom (ofuro), which was often not the case about 30 years ago. Bath water in Japan is much hotter than what is usual in Central Europe. The temperature is usually well above 40 °C. In medical literature, 47 °C is considered bearable. The heat is considered a prerequisite for complete relaxation. The custom is to thoroughly clean oneself with soap and rinse before entering the tub, so as not to contaminate the bath water. Until the 19th century, the Japanese did not use soap, but rubbed the skin with certain herbs, or rice bran, which was also a natural exfoliant.